The Prima Pappa is the modern addition to the Peg Perego family. Ultra-light and yet multi-functional, it grows with your child from 0 to 3 years of age. During the first months it is a comfortable recliner, as baby grows it can be used as a high chair for feeding and playing. 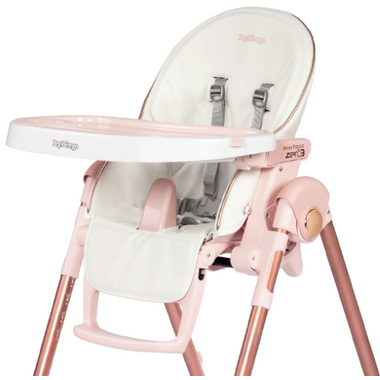 The removable tray and 7 different height settings and 5 recline for the seat, allow baby to sit with you at the table in comfort. The Prima Pappa offers convenience and functionality in the form of an ultra-compact high chair! Weighing under 17 pounds / 7.7 kg and with four non-scratching rubber wheels, the Prima Pappa can be manoeuvred around the kitchen with ease. When dinner time is over, the high chair folds compactly and with little effort. It's folded dimensions of 11.75" x 37.16" / 29.8 cm x 94.3 cm allow it to be stored in small spaces, making it perfect for apartment living. 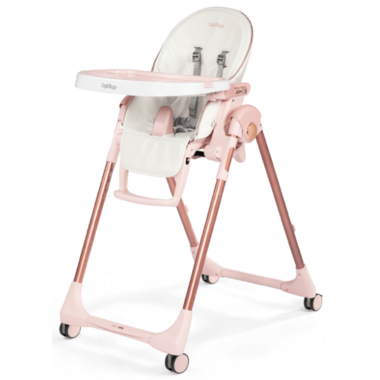 The Prima Pappa Zero is one of the only high chairs that can be used from birth because of its full recline. Seven height positions enable the high chair to grow with child, and a removable double tray makes it possible for little one to join the rest of the family at the dinner table. Playful colours and characters adorn the tailored upholstery of the Prima Pappa. Colour accented tray liners add to the fun and are dishwasher-safe. Finishing off the design are the streamlined, and lightweight aluminum legs of the Prima Pappa. Adjustable Height: Seven different height positions. Wheels: Non-scratching rubber wheels with rear brakes. Easy to Clean: Durable upholstery can easily be wiped clean with a damp cloth. Removable Tray: Tray removes easily with one-hand, stores on chair's back legs. Includes dishwasher-safe tray liner. Compact Fold: Easy and compact standalone fold.